The bird that fascinated the world ever since its ‘discovery’ by western science in 1839 has provided sustained interest for over 170 years and shows no sign of dropping out of sight any time soon. Its story began with London’s natural history and fossil bones guru of the day, Richard Owen, and continues today in ancient DNA labs around the world. Combined scientific knowledge of these giant birds has now reached unprecedented heights for a totally extinct species. This attractive book takes us from the earliest moa-bone discoveries in the 19th century and the controversies that arose over their interpretation through to the latest research techniques which are unravelling intimate details of the lives and deaths of moa as humans invaded their island sanctuary. 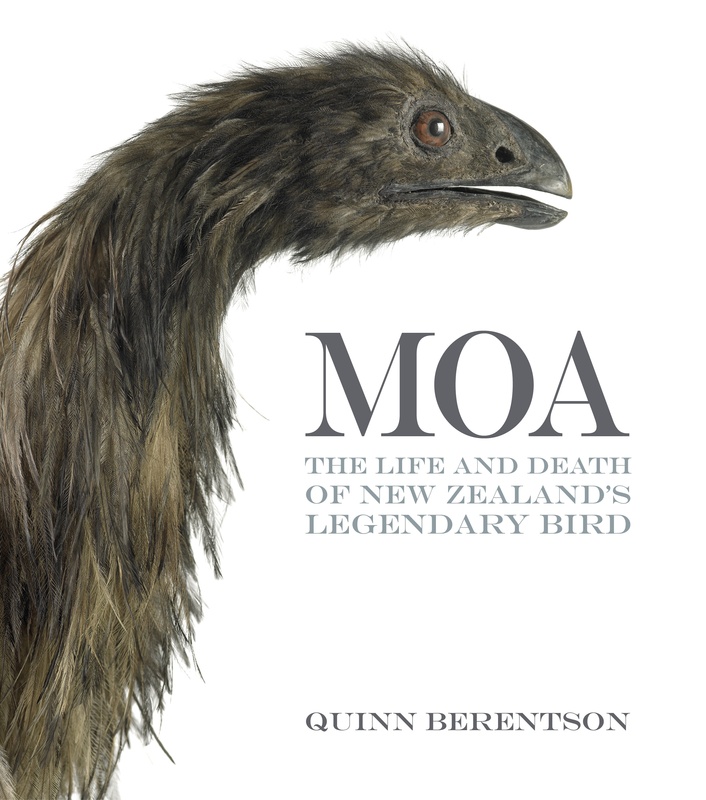 Quinn Berentson, a documentary film-maker and writer rather than a scientist, set out to capture the story of moa. In so doing he has opened many disparate sources of information, dug out some wondrous old illustrations, investigated the lives, rivalries and passions of our early natural historians, and participated in an archaeological expedition to the Wairau Bar in 2009. There are valuable, and certainly entertaining, insights into the ways scientists make progress. From the discovery of mysterious large bones on a number of fronts, through the dominance of a few, very competitive individuals and a ‘gold rush’ for bones destined for the museums of the world, the drive for knowledge of the giant birds has now moved into modern laboratories devoted to molecular biology and radio-carbon dating. Particularly intriguing were the early competitive efforts to construct ‘the tallest’ museum skeletons from the available miscellany of bones rather than waiting for someone to dig out a whole bird intact, so that at least the display could represent a real individual bird. The end result of all these research endeavours is that we can now say moa are probably the most thoroughly understood of all extinct organisms. 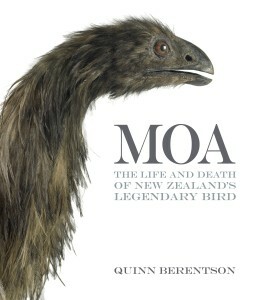 The moa story is not restricted to tales of strange birds and their discovery, but reveals the personalities of those who brought the story to light. This book dispels any notion that scientists are a boring lot – objective robots without emotional involvement. Berentson begins with ‘the most unscrupulous scientist in Britain’ – Professor Richard Owen of the Royal College of Surgeons, London – setting the scene for early discovery sections of the book. The scraps between Owen and geologist Gideon Mantell in Victorian England, and later between Julius Haast and James Hector in New Zealand, are dramatic. The early discovery of moa bones led to ‘highly personal and nasty in-fighting…between those who competed to study them’. Some became ‘international celebrities and accumulated wealth and titles by the dozen, others succumbed to treachery and despair and lost their lives while pursuing the moa’s intrigue’. Moa offers snippets from the lives of a whole sequence of individuals who contributed time and expertise to parts of this story – churchmen William Colenso and William Williams travelling in Hawkes Bay, John Rule a flax trader in Sydney, Richard Owen, Gideon Mantell and his son, Walter, who ventured to New Zealand to become his father’s field assistant. As the fossil bone carpet rolled out, notable New Zealand-based players were Julius Haast, Alexander McKay, James Hector, and Frederick Hutton, who timed their moa-rush to perfection as new moa sites were being revealed. In 1991 Wellington’s Alan Cooper ushered in a new era of molecular analysis for the moa story when he utilised a pioneering approach toward ancient DNA sequencing and found evidence that kiwi shared their history with Australia’s emu, whereas moa were related to South American stock. This DNA research has progressed rapidly to reveal so much detail about the lives of moa that we can now view them as living breathing animals. Berentson reviews much of this progress, but not with the intensity that he put into the historic background and fossil story. With more in-depth sampling from good moa sites, the finding of their dried droppings (coprolites), gizzard remains with contents, egg-shell deposits, feathers, impacts on native plants, sexual dimorphism, and various likely nesting sites and habitats, we now have a plausible ecological scenario for nine species of moa living throughout New Zealand when Polynesians arrived. Unfortunately the same confidence cannot be applied to the vexing questions of when and how they came to be in New Zealand. Despite more moa family trees being published than there are species of them, the assurance that Berentson offers is yet to come. The author’s acceptance of the most recent publication implies a mystery solved, rather than another step in the moa origin hypothesis, serving to remind us we are still in the realm of speculation as to how they got here. We can still look forward to new discoveries, such as Cretaceous fossils of ratite birds which could be used for calibrating molecular clocks. Meantime, thank you Quinn Berentson for recording your researches in such a readable form. George Gibbs is an entomologist who since retiring from Victoria University has followed his interest in historical biogeography by continuing research on a group of primitive jaw-moths. His book Ghosts of Gondwana: the history of life in New Zealand has recently been reprinted. The giant birds are an iconic part of that story.